Like loud noises? At Pro Audio Centre they love nothing more than helping you turn it up to the max – and with a Pro Audio Centre voucher you can make great savings while you shop. From full PA systems suitable for large spaces to the very best home studio equipment – plus a wide range of lighting and effects that are great for parties – Pro Audio Centre vouchers are a fantastic way to get all the latest sound kit without spending a fortune. Founded in 2010, Pro Audio Centre started life as an internet-only retailer dedicated to selling the very best audio and lighting equipment to customers around the UK. Following the success of this venture, Pro Audio Centre launched their physical store in Leeds, West Yorkshire – the spiritual home of the British live music scene. Pro Audio Centre is dedicated to providing a quality, professional service to all of its customers, whether you're a venue or a promoter looking for high quality lighting and décor solutions, a musician looking to build a comprehensive home studio or just someone with a casual interest wanting the very best audio for in and around their home. All of their products are supplied by reliable names in the industry, so you can be guaranteed a quality purchase. And if you're not sure exactly what you need, you'll find a team of expert, knowledgeable staff available both online, on the phone and in person to help you make the decision. With free design and consultation services for any project large or small and free technical support post-sale, Pro Audio Centre is ideal for anyone that needs a helping hand. At Pro Audio Centre's comprehensive online shop, customers can browse through hundreds of audio and lighting products arranged by category or manufacturer. Need a full set of stage lighting? Choose from the wide selection available online or speak to the staff about putting together your own custom package. Building a home studio and want the very best in monitors, microphones and software? You can purchase a kit ready made or put together your own dream combination. Once you've chosen your products, you can relax knowing that you're getting the very best deal. Pro Audio Centre even operates a Price Promise – if you find the same product cheaper elsewhere they'll refund the difference. And with a range of delivery options designed to get your order to you as quickly and efficiently as possible, you'll be ready to get started in no time at all. 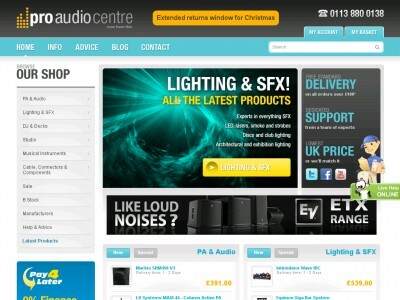 Want to get shopping with Pro Audio Centre? With a Pro Audio Centre voucher you can save money while you shop. Whether you want a whole new Hi-Fi system or just a few important cables, Pro Audio Centre voucher codes will help you save the pennies. Stocks hundreds of audio and lighting products. Browse our website until you find a Pro Audio Centre voucher that suits you, then navigate to their website to begin shopping. Enter your Pro Audio Centre discount codes where applicable. If you've enjoyed shopping for audio and lighting kit with Pro Audio Centre, you might like to check out more great deals on electronics with Sony or Currys. Or, if those aren't up your street, you'll find plenty more stores to browse in our dedicated Electronics section. Enter your Pro Audio Centre voucher where applicable. Click 'Pay with credit/debit card'. Enter your payment details and click 'Authorise' to complete your booking. Delivery charges vary dependent on the size and weight of your order. If you need to return a product for any reason to Pro Audio Centre, you can do so by simply returning the item in its original packaging within 14 days of receipt. Need to contact the team at Pro Audio Centre? Whether you have a question about your order, want some expert advice on the right equipment for you or simply want to find out more about how you could make big savings with Pro Audio Centre voucher codes, you can contact the Customer Services department by telephoning 0113 880 0138. Want to find out more about what's happening behind the scenes at Pro Audio Centre? Why not follow the company across all your favourite social media platforms? You'll find lots of entertaining content including product guides and overviews, competitions, special offers and more. You can also use these pages to find out more about saving money with Pro Audio Centre vouchers. Don’t forget to check them regularly, as you can never be sure when free Pro Audio Centre discount codes might be waiting for you! Buy now online at www.proaudiocentre.com. My teenage nephew loves making music, and wanted equipment for a home studio for his birthday. Thanks to the Pro Audio Centre voucher I found online, I was able to get great deals on a wide range of audio kit at proaudiocentre.com. You can use Pro Audio Centre voucher codes to save money on everything from mixing desks to software – so it's great for budding musicians and producers. I used my Pro Audio Centre vouchers to treat him to a new microphone – why not see what you could save with a Pro Audio Centre discount code?